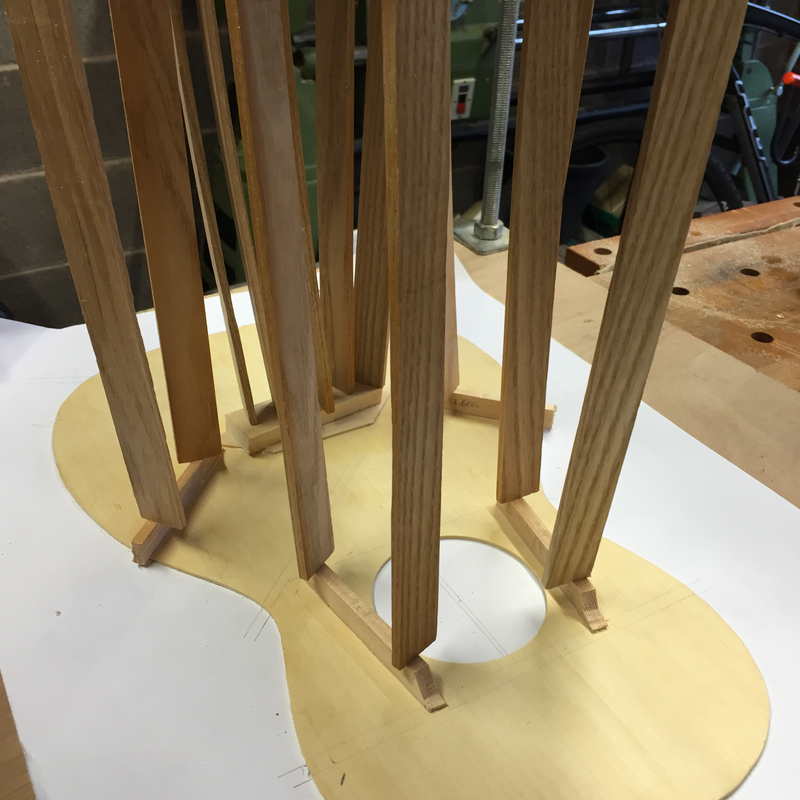 Bracing is one of my favourite elements of building acoustic guitars. It is the perfect balance of ensuring structural integrity and sculpting the sound of the resulting instrument. Brace too lightly and the soundboard could fold under the several hundred pounds of string tension. Brace too heavily and the soundboard will not be free to resonate, and the sound will be muddy and lifeless. 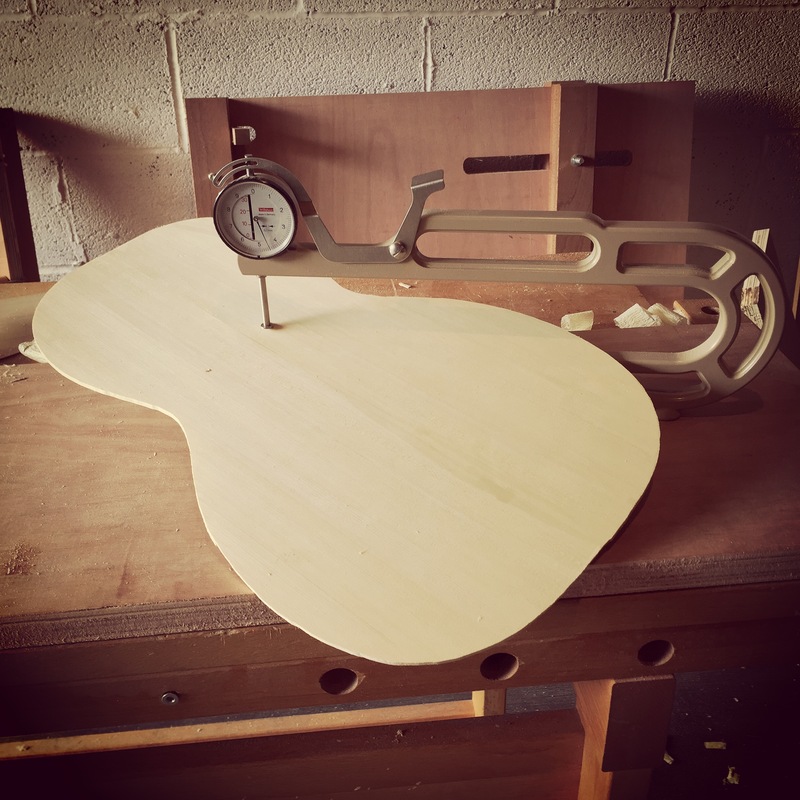 Building acoustic guitars is a constant calibration of many different factors (body size, body shape, timber selection) and bracing encapsulates this perfectly. The appropriate bracing pattern must be selected for the desired sound (pre-war ladder bracing? X bracing? A bracing? ), then the size of the braces in terms of thickness and height of each brace determined for the stiffness and strength of the specific soundboard timber being used. That is a lot of juggling to do, and it is wonderful. The flat braces and bridge plate. The bracing for the parlour guitar is a pretty standard X brace, with a single finger brace on each side of the main “X” brace, two transverse braces across the upper bout, and a single tone brace off the lower leg of the treble side of the “X”, along with three soundhole reinforcement braces and a bridge plate. 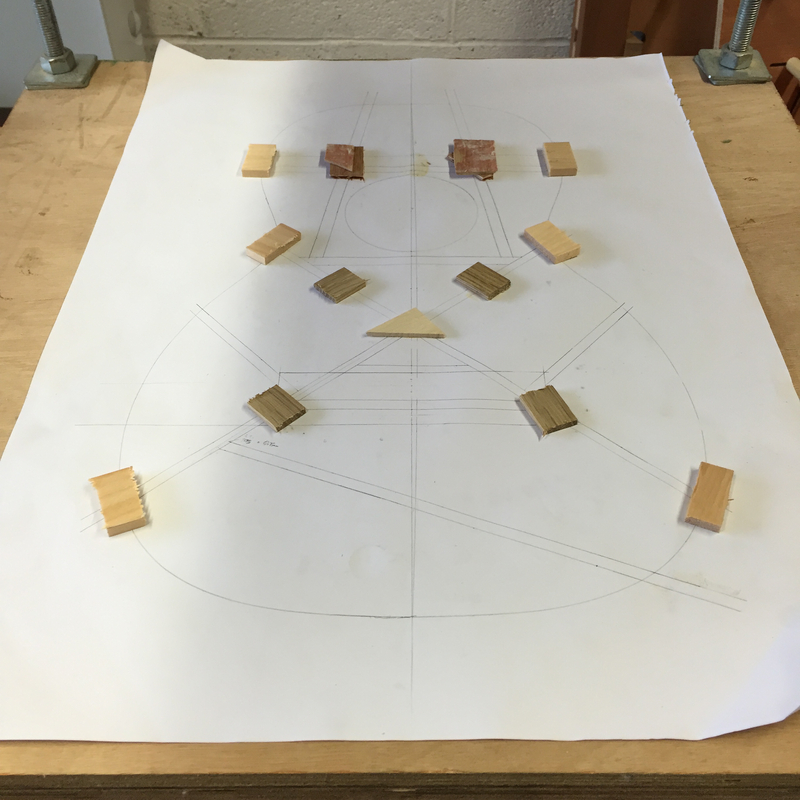 The first step I always take is to draw a full size plan of the bracing, onto which I mark the curvature of the soundboard (there will be more on the curvature in my next post). I also then draw the position of all of the braces onto the inner face of the soundboard itself, using a very fine and light pencil. This helps ensure that they are in exactly the correct position come glue-up. In the past I have glued all of the soundboard braces in one go. This can mean a glue-up session involving 11 or more braces, each with multiple go bars providing clamping pressure. Which tends to get pretty intense. So for this guitar I decided to split the glue-up into two sessions. The first session would be gluing the flat braces, and the second would fit the curved braces. I prepared all of the brace stock in one go – cutting a 12mm wide, quartersawn, slice off a large block of spruce I keep for bracing. This was my first proper opportunity to give my new (to me) 1900 era Disston D8 a try, and it cut through the 3.5″ spruce like butter. There is a reason why the D8 is the king of rip saws! The spruce slice was then flattened with my No.8 jointer plane, and the slice split into smaller sections each containing two braces. These smaller elements were planed down to thickness and the flat braces then split off using a fret saw. The reason for thicknessing the braces in pairs is that this gives larger work pieces which are easier to hold in place whilst planing. 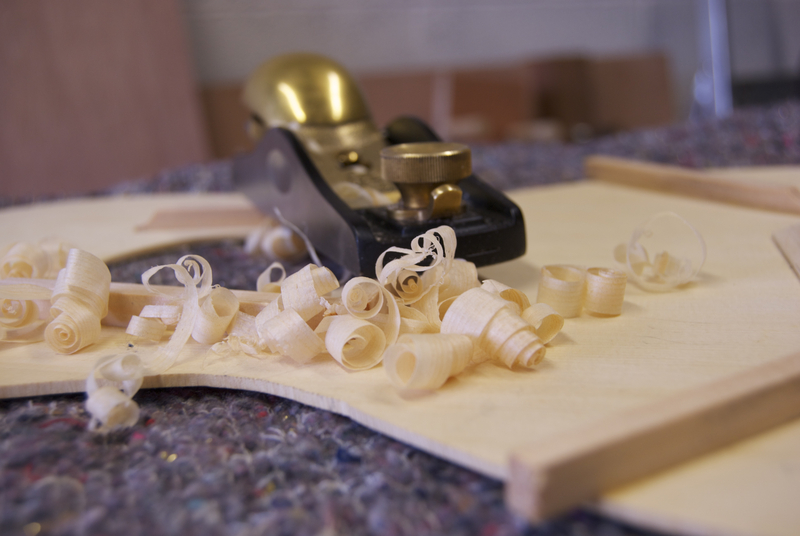 The three soundhole braces are each 8mm thick, while the two finger braces and the tone brace are 6mm thick. All braces were left at 15mm high for ease of gluing, and I left each of them 6mm overlength. The soundhole reinforcement braces each have angled ends where they meet other braces. 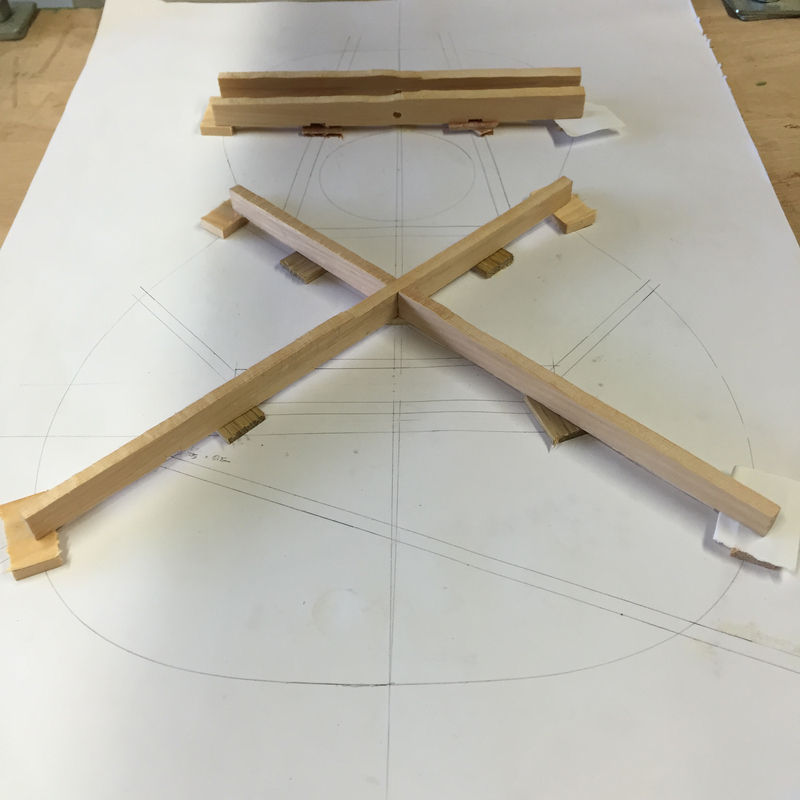 Rather than use a sliding bevel to mark these angles, I showed each brace to the bracing plan, and marked the intersection with the adjoining braces using a small marking knife. The waste was then removed with my 12″ carcass saw and I snuck up on the final angles with a low angle block plane. With the flat braces ready to be glued, I turned my attention to the bridge plate. This was made out of a straight grained piece of maple, which I planed flat and cut to shape using my carcass saw. The lower legs of the X brace pass under the rear corners of the bridge, and the bridge plate extends 8mm in front of the bridge and 15mm behind the bridge. Once cut to size and shape, I then bevelled the edges of the bridge plate with a block plane. For the first stage of glue up I placed bracing plan on the deck of the go-bar station, with the soundboard facedown. The flat braces and bridge plate were then glued in place using original Titebond and secured with go bars, before being left overnight for the glue to cure. 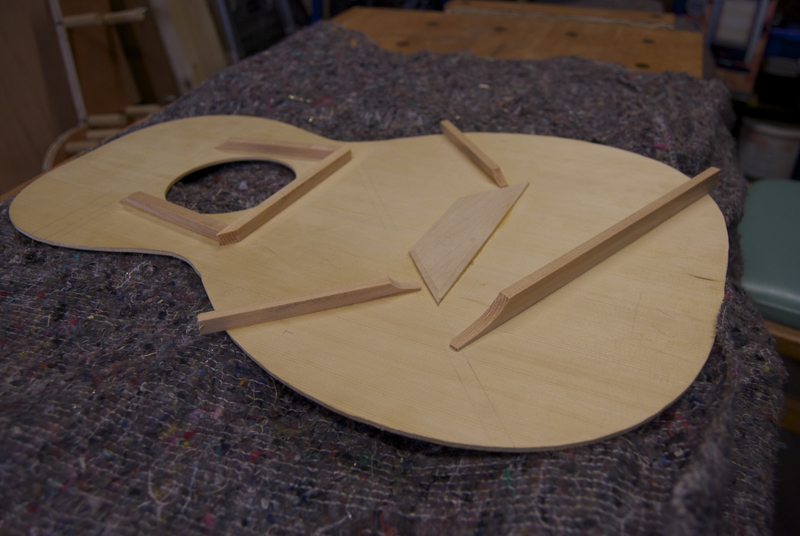 A shot partway through the first glue-up – the third soundhole reinforcement brace and the tone bar have not yet been fitted. 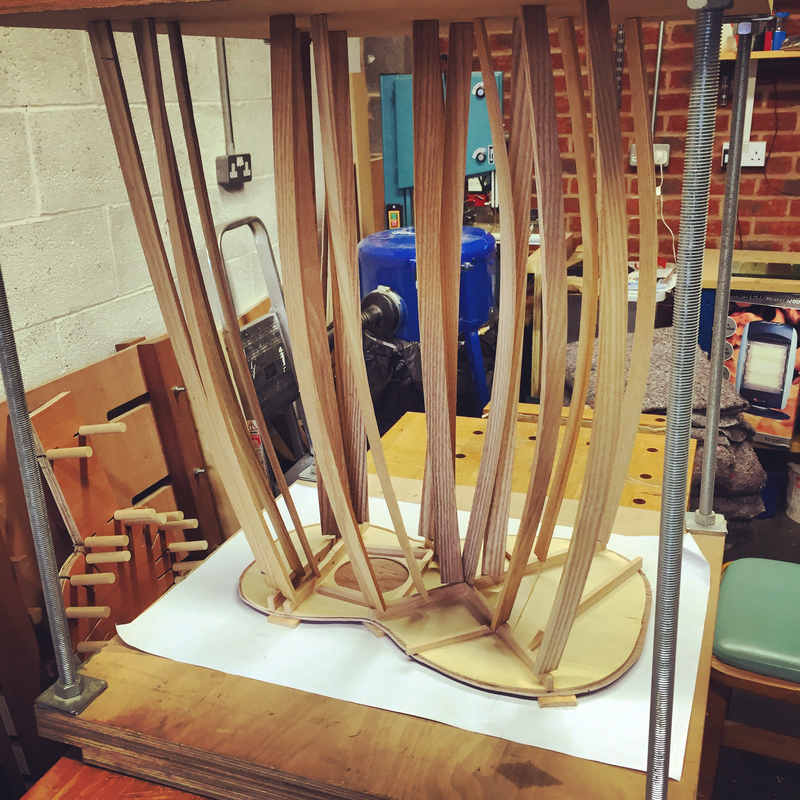 In my next post I will describe the more involved processes behind the curved bracing – which is where the fun really begins! Back in April I cut and installed the headstock inlay for the parlour guitar, and wrote about the process for Furniture & Cabinetmaking (issue 236). What follows is an expanded version of that article. The first task with any inlay is to select an appropriate design. 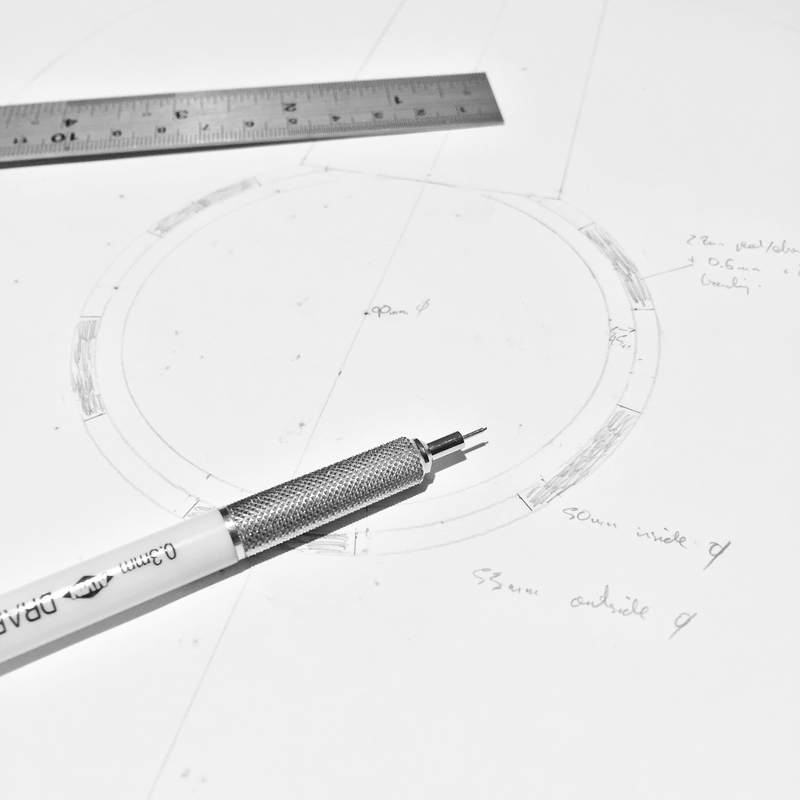 I find that line drawings work best, as they give a clear indication of where the cuts need to be made, and ensure that the design is not overly dependant on engraving. I make multiple copies of the final design, and mark on the master copy the material which will be used for each element of the work. 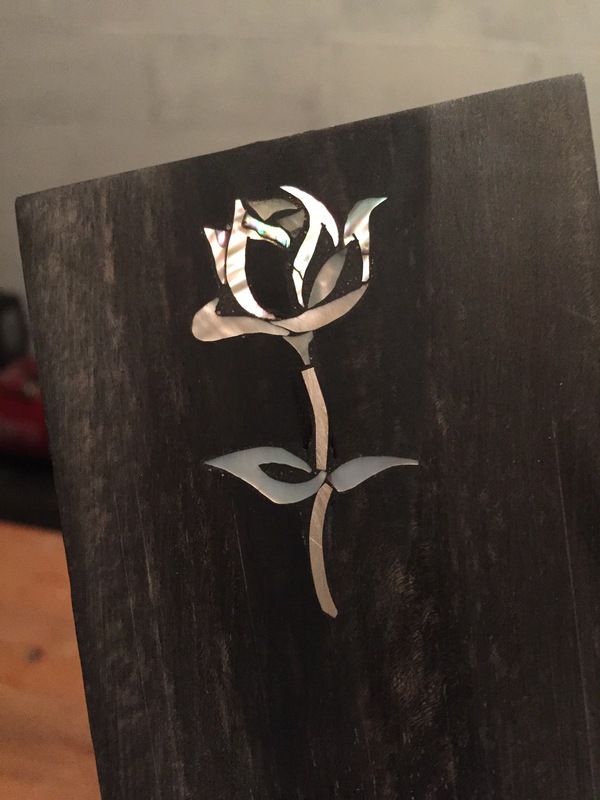 For the parlour guitar I chose a rose design, the stem of which is 1.5mm square sterling silver wire, the leaves are mother of pearl, and the petals are both green and red abalone, all set into an ebony headstock veneer on a steamed pear neck. 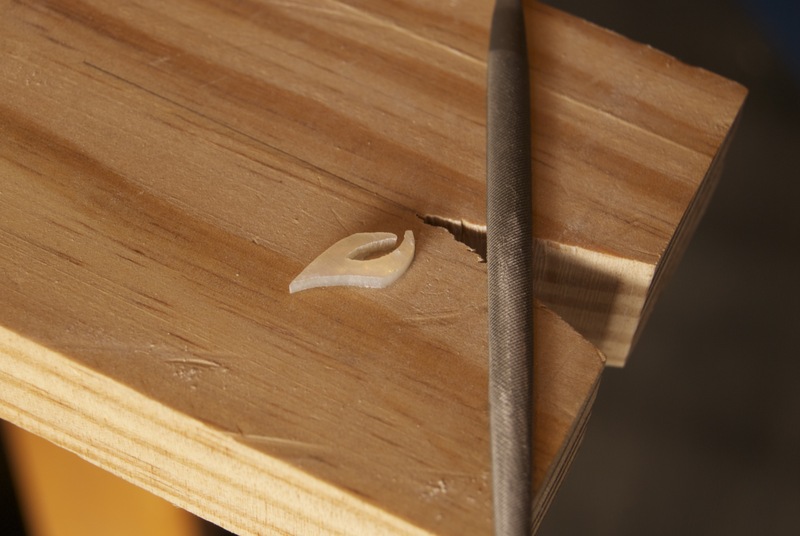 Shell blanks can vary in thickness, which can make life difficult when it comes to cutting the recess for the inlay. 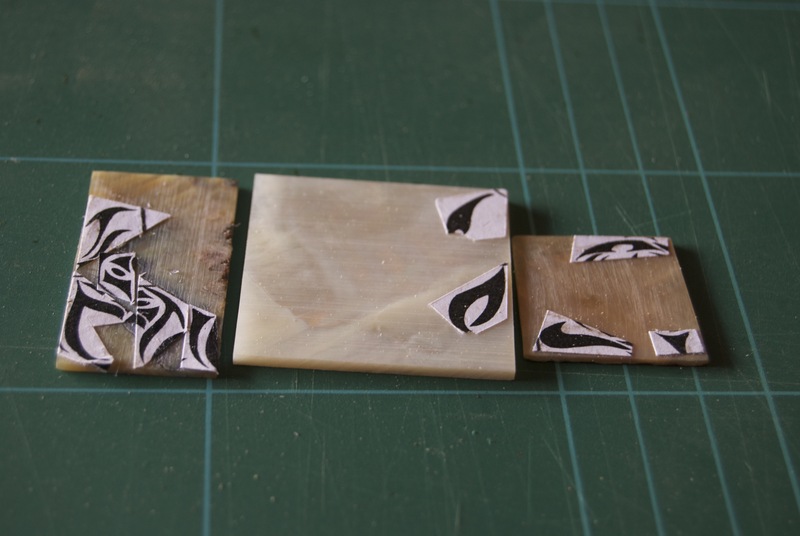 So before I start cutting I check the thickness of each piece of shell with callipers, and any pieces which are too thick are brought down to thickness by sanding with 80 grit paper on a piece of 10mm thick float glass. It is important to thickness from the back of the shell, so that the show face isn’t worn though. With the shell thicknessed, I glue sections of the design onto the shell using contact adhesive (this is why multiple copies of the design are necessary). Correct orientation of the shell is critical to a design translating well to inlay, and I always seek to arrange the design so that different elements catch the light from different angles. If the whole design catches the light at the same point then it will look stunning from that position, but dull from every other perspective. If light catches different elements of the shell as you move around the design, then it will look good from every angle. To cut the shell I used a Knew Concept’s piercing saw and No.2 blades, cutting right on the line and supporting the work with 3” wide piece of southern yellow pine into which a “v” shape has been cut. The saw blade moves within the “v”, while the shell remains supported on two sides, which keeps it from snapping. For cutting curves, the shell is slowly rotated, and the saw maintains a constant position. 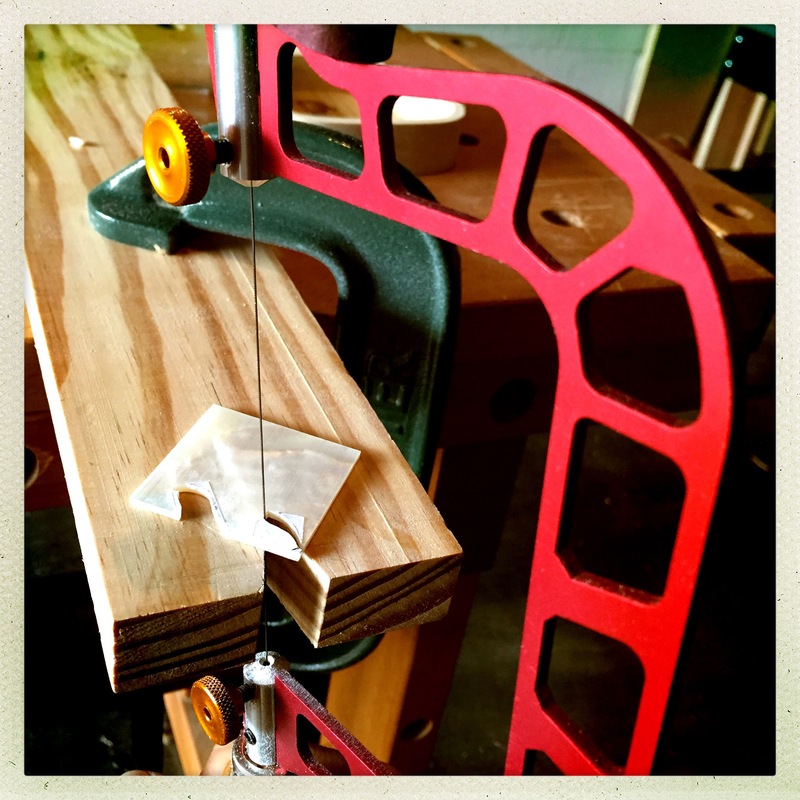 Those with ninja-level sawing abilities will be able to inlay shell straight off the saw. For the rest of us, a set of needle files is essential to refine shapes. I use the same birdsmouth support when filing the shell, and this helps keep the filed edges of the shell at 90 degrees to the show face. Once the shell has been cut and refined, it is time to cut the recess. I glued another copy of the design to the work piece, and defined the edges of the recess with No.10 blade scalpel blade. This can be done either by tracing the edge of design, or around the shell pieces, depending on design. This ensures that the shape of the recess remains crisp and no more material is removed than necessary. For this design, I scribed round the line drawings, as there were too many small pieces to make scribing the outline of each piece of shell practical. If the recess is large I use a Lie Neilsen No. 271 router plane fitted with a 1/32” cutter and the optional depth stop (which for this work is less of an optional fixture and much more of a necessity). This design was too small for the router plane, as the plane blade would have bruised the sides of the recess. So instead I used a Dremel in a router stand, and a 1.6mm down cut spiral cutter. Whichever method you chose, it is key that the recess be uniform in depth, placing the top surface of each piece of shell at, or just under, the surface of the wood. This is so that when finish sanding, the thin show surface of the shell is not sanded through, and that any film finish does not collect in hollows and obscure the inlay design. Wire is much easier to bend before it is cut to length, so I placed the end of the wire stock in the recess and guided the wire into the channel, bending it to shape. Once bent, I cut it to length and filed away the burrs. Gluing fragile shell can be a fraught experience, so I prefer to use a 24 hour epoxy with working time of at least 90 minutes. 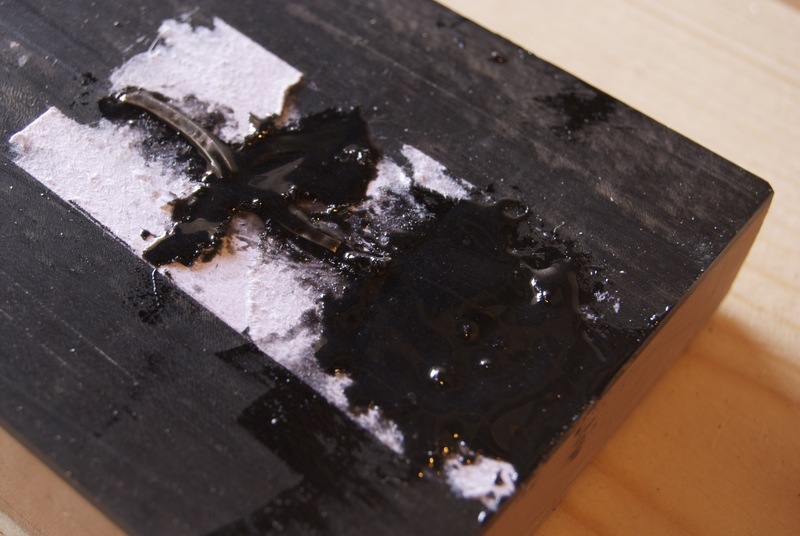 Epoxy can be dyed to match the surrounding wood, either using wood dust or filler dyes. For inlay set into ebony I use lamb black to dye the epoxy, adding it slowly until a good colour match is achieved. Ensure a good coverage of epoxy on the sides and floor of the recess, and then place the pieces in. 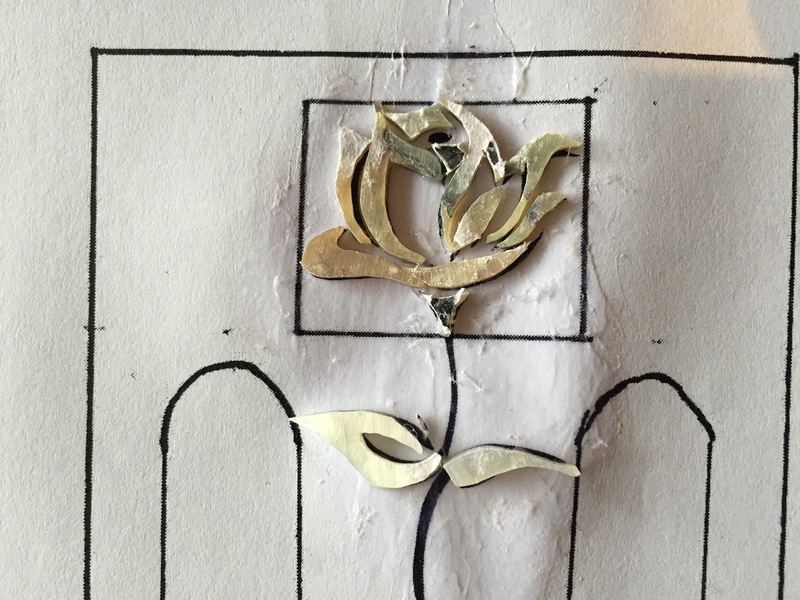 On designs with a number of pieces in a single cavity, such as this rose design, I fit the interlocking pieces first, followed by any free floating pieces. The one disadvantage of epoxy is that it can be very thick, and so it is necessary to really press the shell into place (while taking care not to snap the shell) to make sure it is flat on the floor of the recess. I then left the epoxy for 24 hours to set and cure, and then sanded the excess back with 340 grit paper and a hard sanding block. The inlay is glued in and left to cure. I’m pleased with how this inlay has turned out, and hopefully this post goes some way to demystifying the processes. 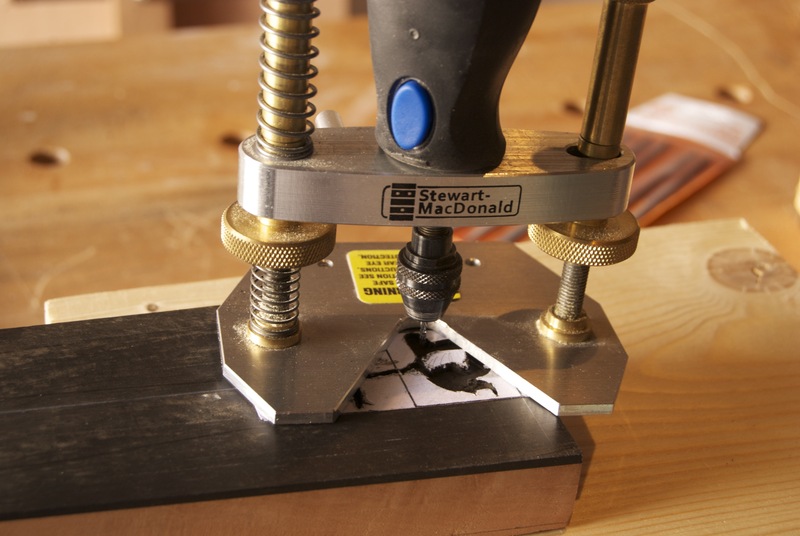 With careful cutting, filing and routing, pleasing inlay is within the reach of pretty much all woodworkers. Progress on the parlour guitar has slowed a little since the Apprentice arrived, but I did find the opportunity to install the sound hole decoration this week. 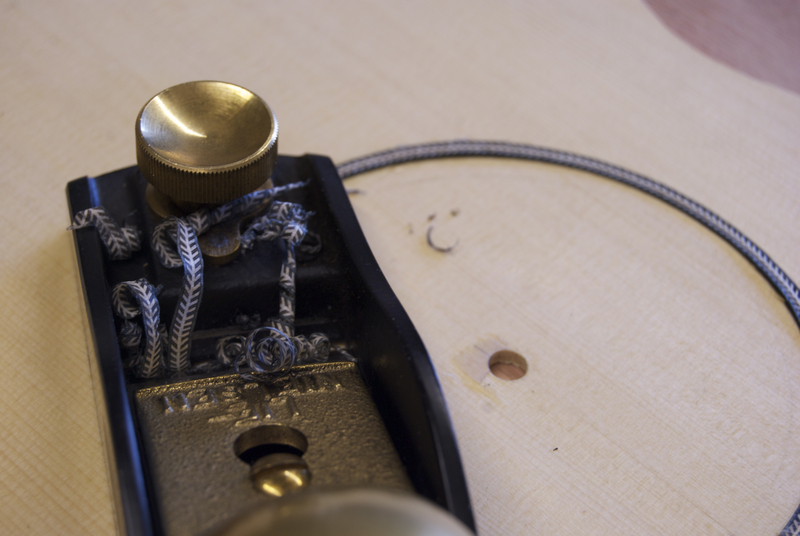 I had intended to work on the sound hole decoration at EWS, and to maximise the number of skills shown in the demonstration my decoration design was alternating blocks of ebony and mother of pearl between ebony banding. As it happened, I had no opportunity to do any work at EWS thanks to the level of interest from attendees. Since EWS I have been pondering the design again, and decided to revert back to my original design of a simple herringbone inlay. 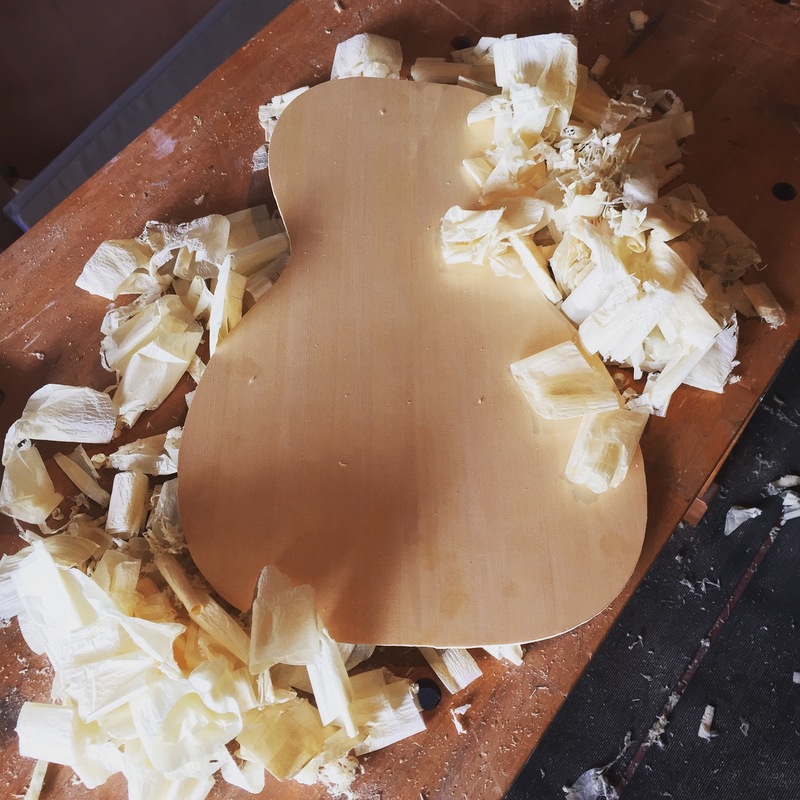 The corner purfling on the guitar will also be herringbone, so the matching sound hole decoration will avoid introducing another clashing element, which is particularly important on a small bodied guitar when the decorative elements are so much closer together. The previous design work was not wasted, as I was able to use the same spacing and circumferences as I would for the shell/ ebony design. Before I make any cuts to the soundboard, I always make a test piece using offcuts from the soundboard timber. 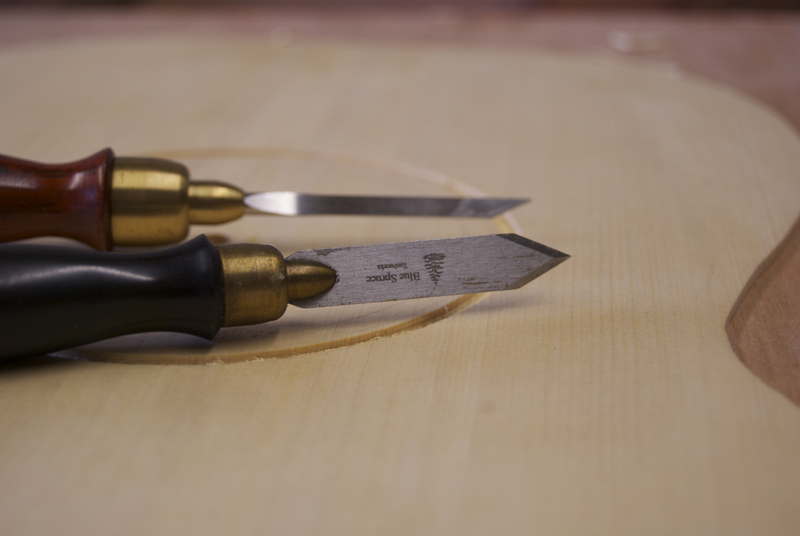 This allows me to check the spacing of the cuts and ensure that the inlay fits before I make the critical cuts for real. The two edges of the trench for the inlay were cut using a rosette cutter from LMII, after which I removed the bulk of the waste with a Lie Nielsen No.271 small router plane. 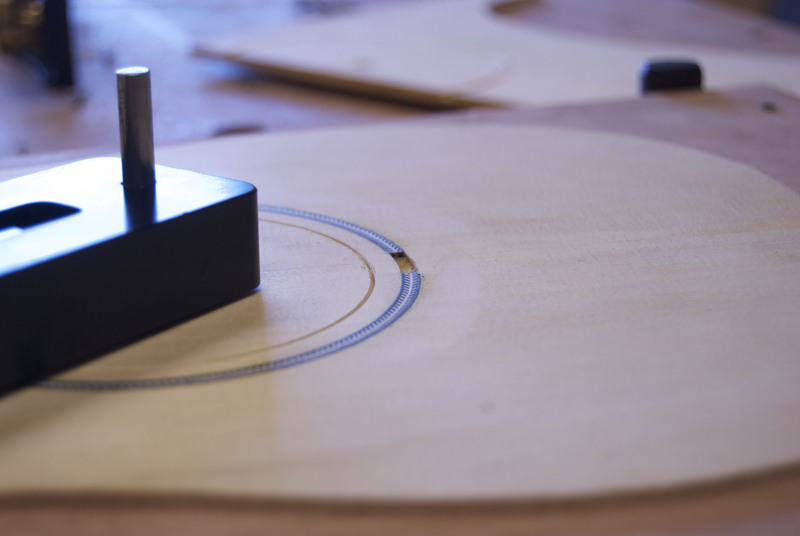 The depth of the trench is critical, as the soundboard is only 2.7mm thick and the herringbone inlay is a little over 2mm high. This gives very little margin for error, and I set the rosette cutter blade to just a hair under 2mm so that a small amount of the herringbone could be removed after gluing. With the bulk of the waste removed, I then fine tuned the trench using a 0.81mm mini chisel and small marking knife, both by Blue Spruce Tool Works. With these I am able to remove any debris from the two corners at the bottom of the trench, so that the inlay fits flush to the bottom. 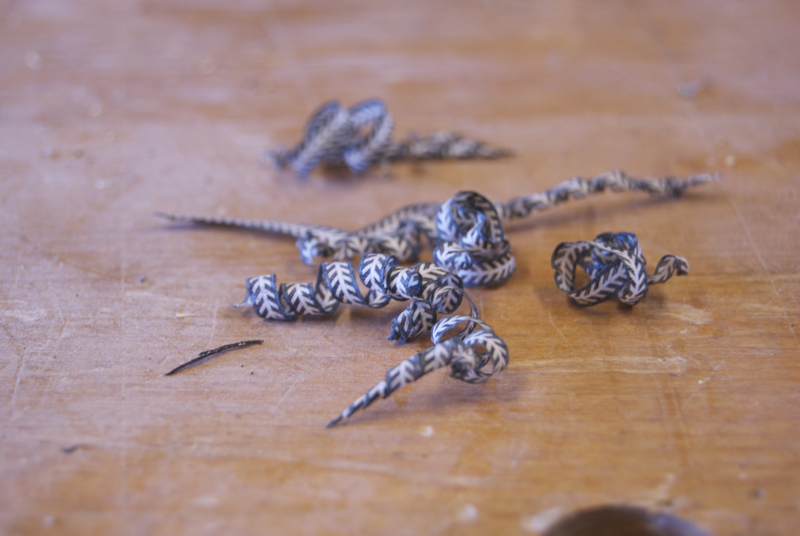 The herringbone banding is very fragile and won’t bend without some gentle persuasion. I bent the herringbone to the correct radius on my bending iron, going very slowly to avoid the edge banding snapping, or (even worse) the marquetry de-bonding and scattering pieces across the workshop. 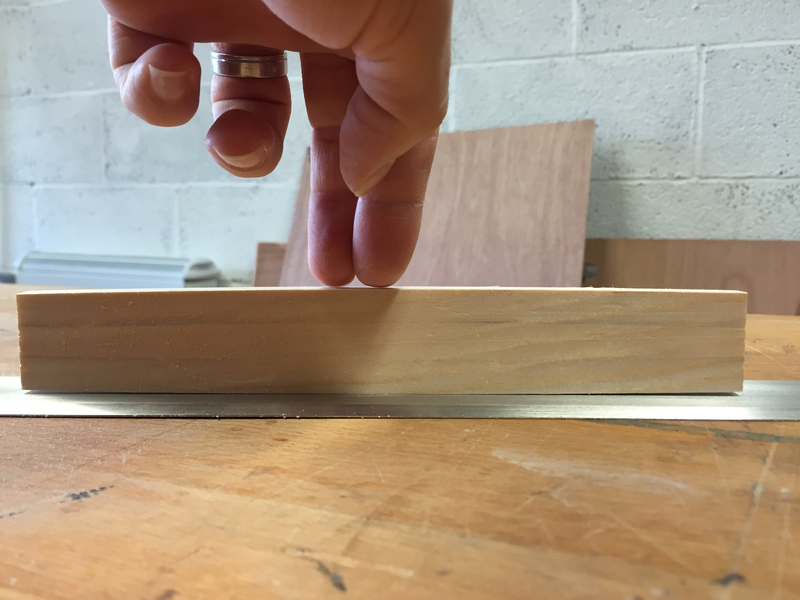 When bending thin banding such as this, the trickiest part is keeping the length of the banding in a consistent horizontal plane, as applying heat to just one side will encourage it to slowly corkscrew as it bends. 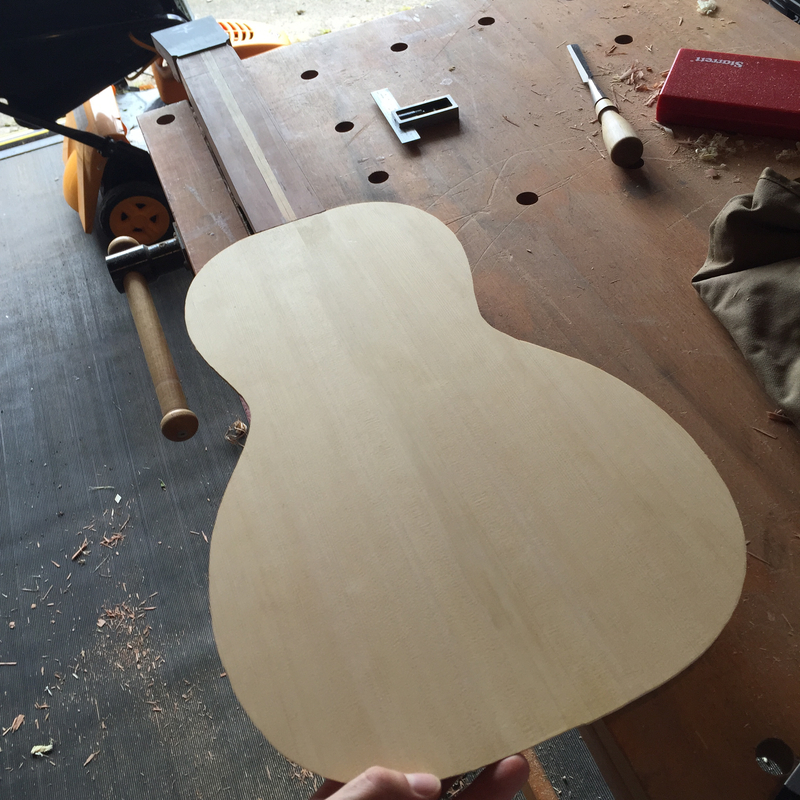 This will result in an inconsistent pattern once the inlay is planed flush to the soundboard. Once the banding was bent to the correct radius I levelled out the horizontal orientation by placing the banding on the flat top of the bending iron and trapped it under a broad chisel for a couple of seconds. The banding is inlayed and ready to be levelled to the soundboard. The banding was a good tight fit in the trench, so a final touch was to bevel the leading edges of the banding with a cabinet scraper. This eased the banding into the trench and ensured that the edges of the trench would not be bruised when the banding was inserted. The banding was glued in using Titebond Liquid Hide Glue, which had been warmed by leaving the glue tube in a jug of hot water so that it was less viscous. Ordinarily I mix my own hide glue, but hadn’t much opportunity recently. The Titebond worked well and I will certainly use it for future work. With a liberal coat of glue in the trench, the banding was placed in position and gently tapped fully into the trench with a small hammer. I left the banding to cure overnight, and then planed the excess banding flush with my low angle block plane, followed by a small cabinet scraper. 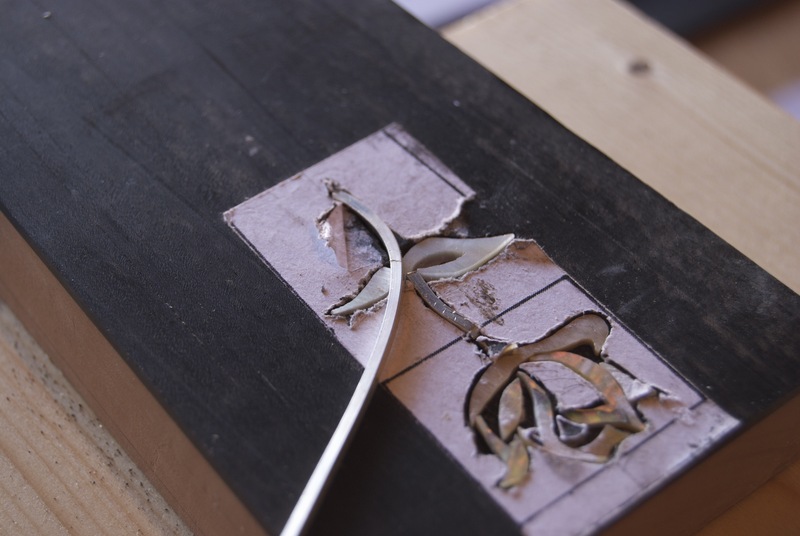 The scraper allows the banding to be taken perfectly flush without removing any material from the soundboard, which is critical given the thickness of the soundboard at this point – there is little opportunity for sanding or removing plane tracks once the soundboard has been thicknessed. 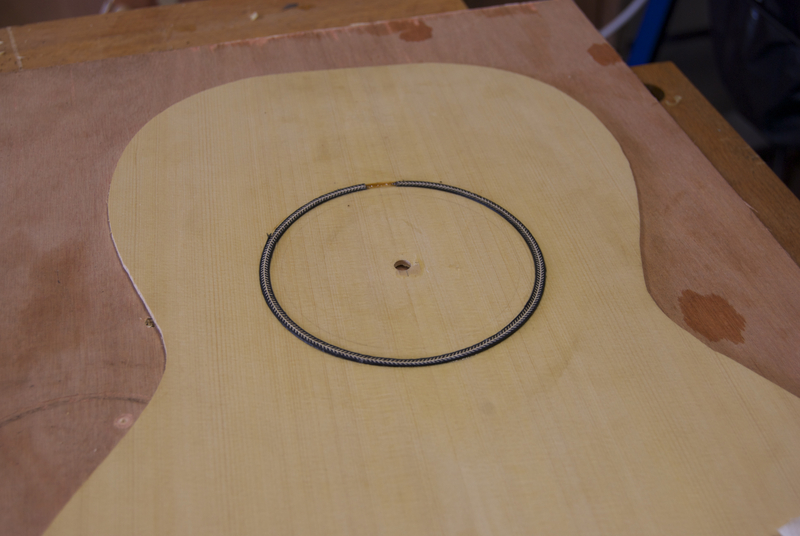 With the decoration complete the sound hole was then cut to a 90mm diameter, again using the LMII rosette cutter and the blade set to the full thickness of the sound board. Next I will be writing about how I approach bracing the soundboard. 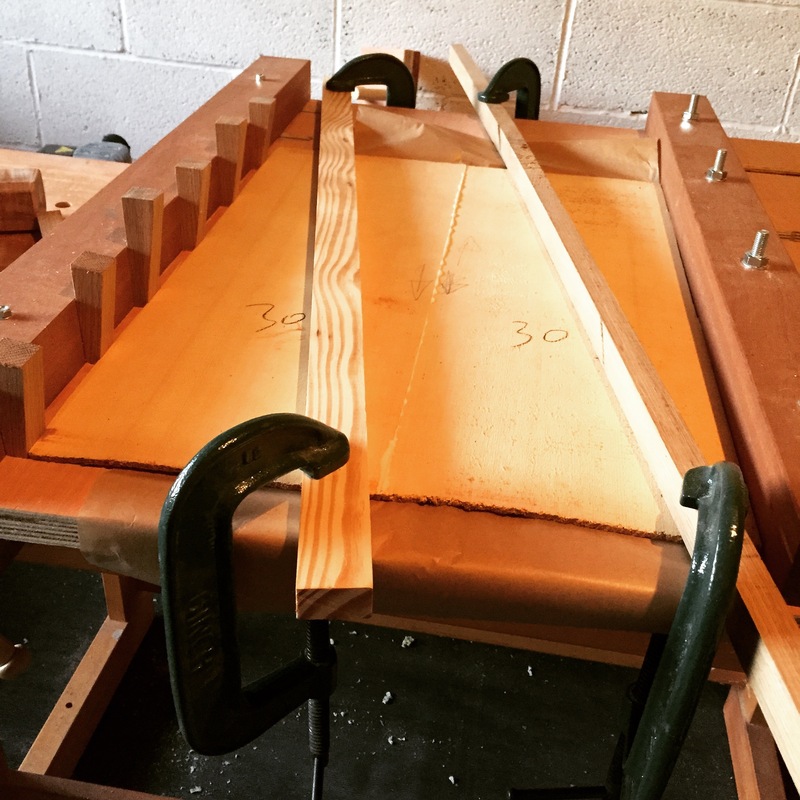 I prefer to leave thin jointed surfaces clamped up over night to allow the glue to cure fully before further work, and so I removed the parlour guitar soundboard from the thin panel gluing jig the morning after it had been glued up. 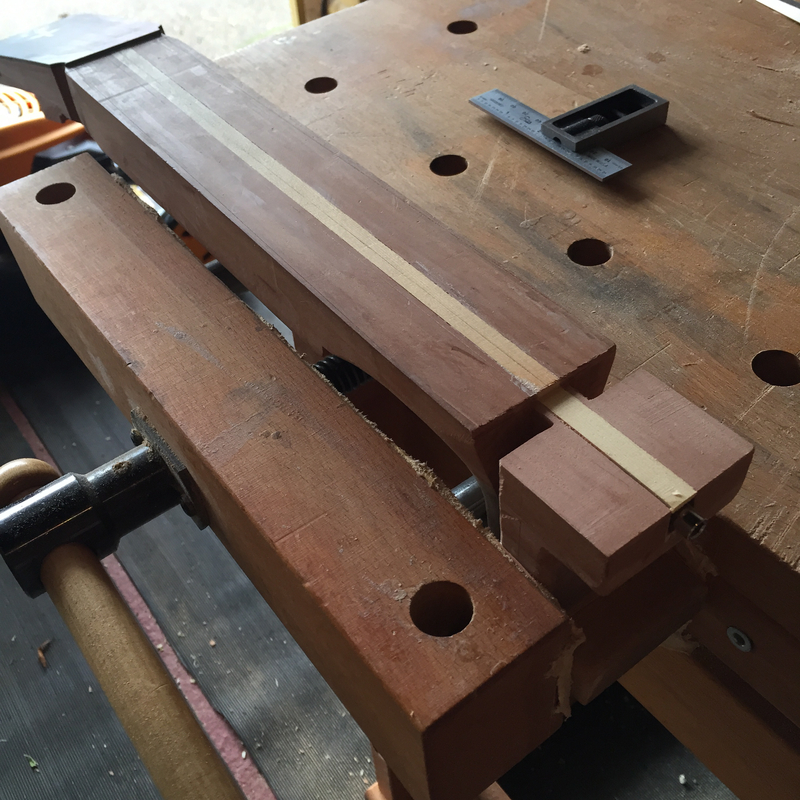 Because I place panels face down in the gluing jig, there can be a slight step on the rear of the join if the panels are not of consistent thickness, so before surfacing the show face of the soundboard I removed this step from the inner face using a block plane. 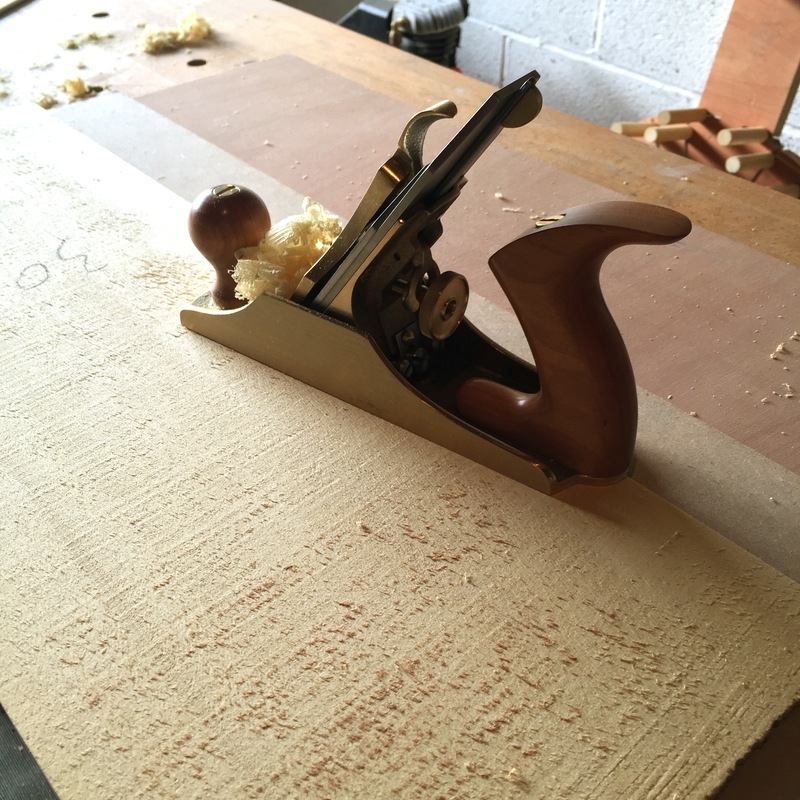 When surfacing soundboards and backs, it is imperative to get the work as flat as possible, as well as achieving a clean surface free from tear out, and this involves constant checking of the work with a machinist’s straightedge. 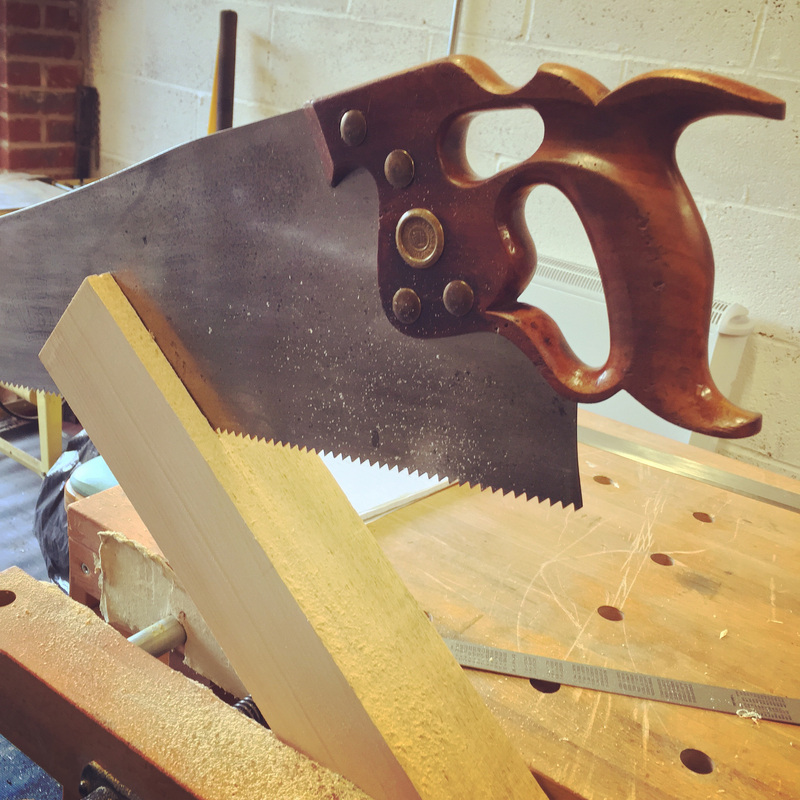 In the past I have used a No.5 jack plane set to a fine cut, followed by a cabinet scraper to remove any hint of plane tracks, but this time around I decided to give the No.8 jointer plane a go, and the extra width of the blade allowed me to achieve a flat surface quicker than I would have with the No.5, and left only a little work for the cabinet scraper. For difficult timbers (particularly the backs and sides of acoustic guitars, which use exotics like rosewood) I use a toothed blade, and I may have to look into getting one made for the No.8 for this purpose. 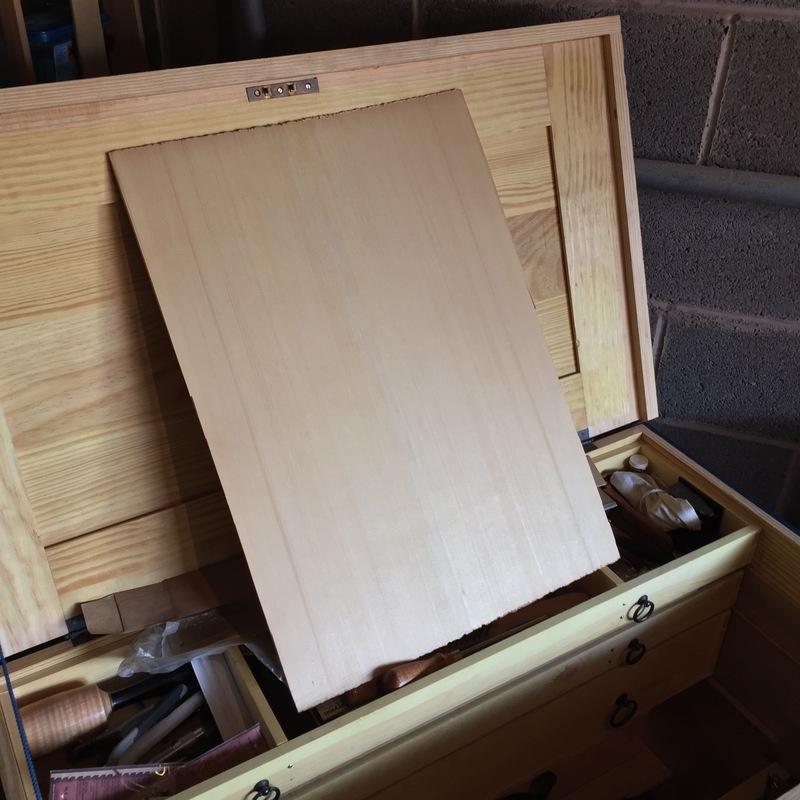 Because the soundboard panels are bookmatched, it is important to change planing direction on each half of the work, so as to avoid tear out, and the cabinet scraper is invaluable for cleaning up the glue line as it seems to resist tearing out while working against the grain. 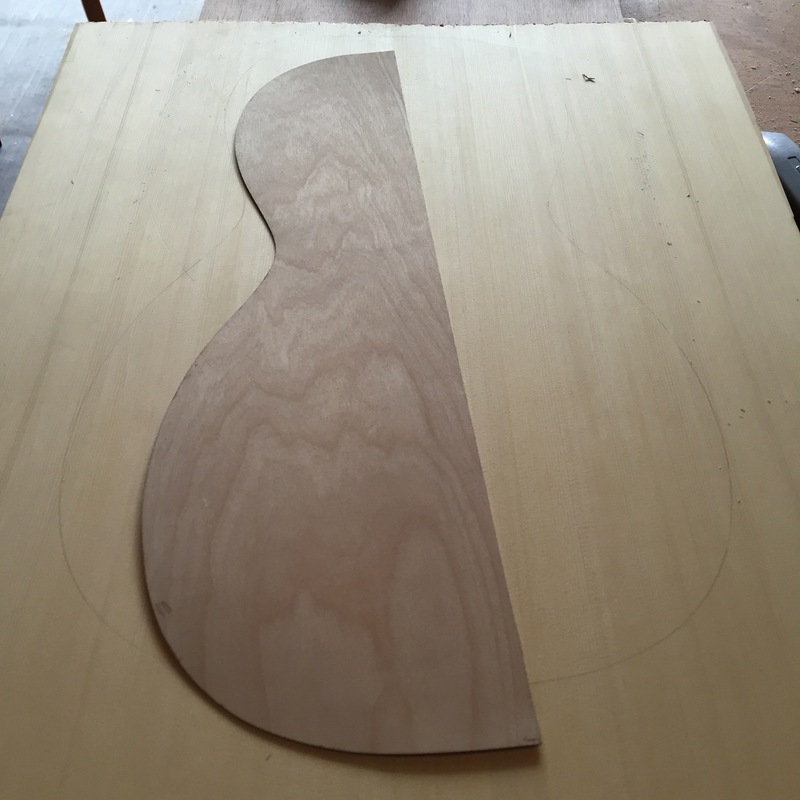 With the full panel surfaced, I marked out the shape of the soundboard using my plywood template, and then cut to shape (staying bang on the pencil line) with a fret saw. 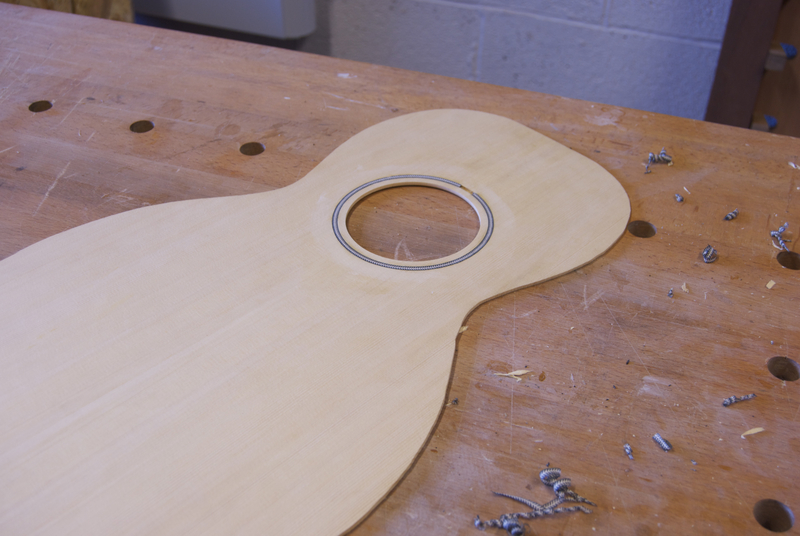 The thickness of the soundboard is critical for the sound of the finished guitar, and with the outer face now surfaced I was able to start thicknessing the soundboard from the inner face. 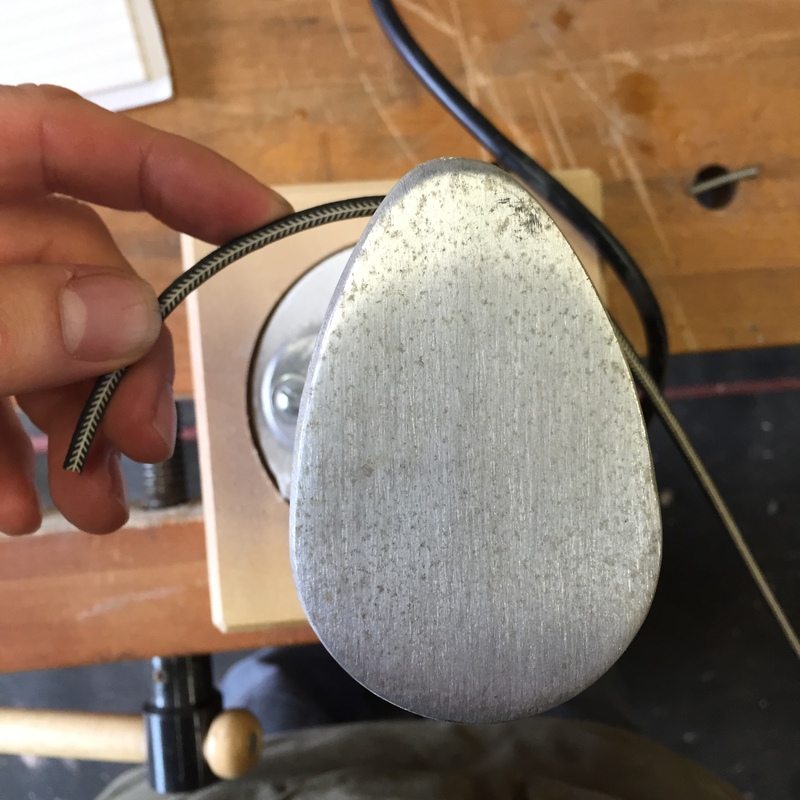 The purpose of thicknessing is to achieve the right balance between a thin soundboard which will be responsive and resonant, while remaining strong enough to withstand string tension without imploding. 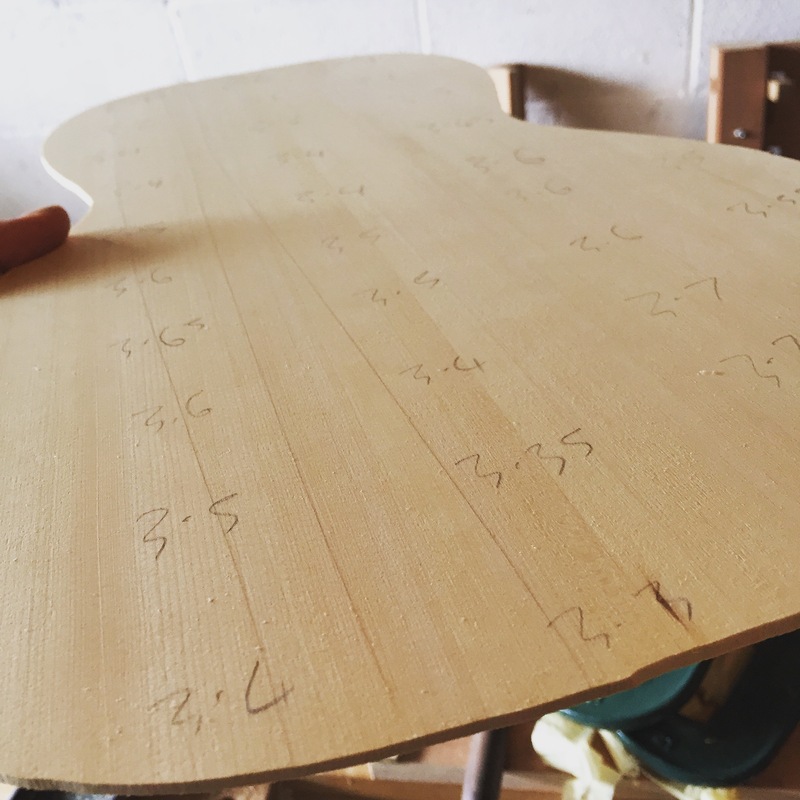 The advantage of handmade guitars over mass produced machine produced instruments is that each soundboard and back can be worked to the optimum thickness for that particular piece of wood, with the bracing further adjusted to reflect the properties of the soundboard and back. Using my large calipers. 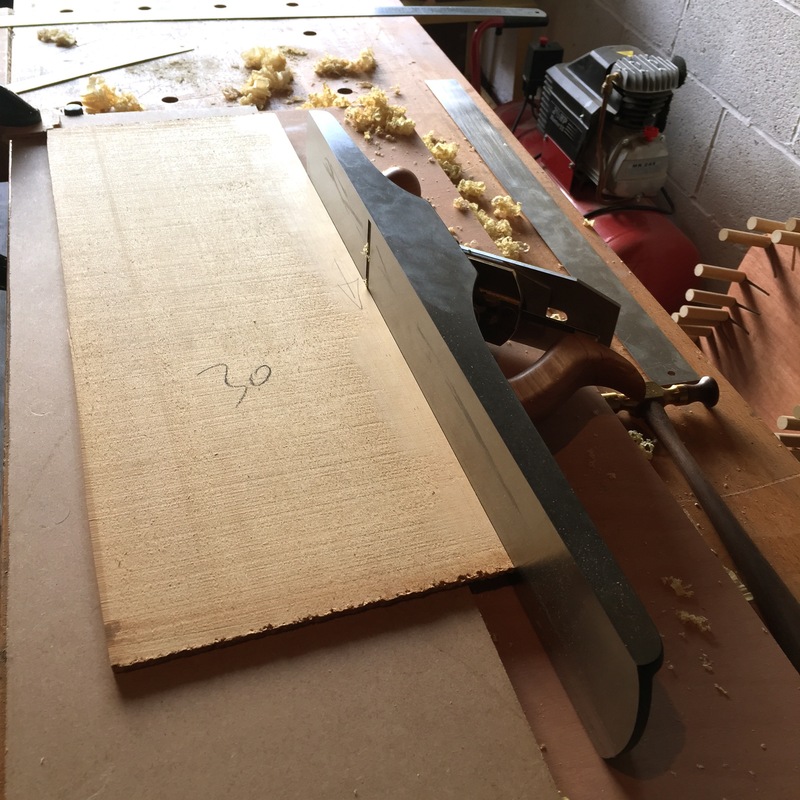 I mark the thickness of the soundboard at 2″ intervals, and then work the high points down until the the soundboard is down to a nominal thickness, using block and bench planes. 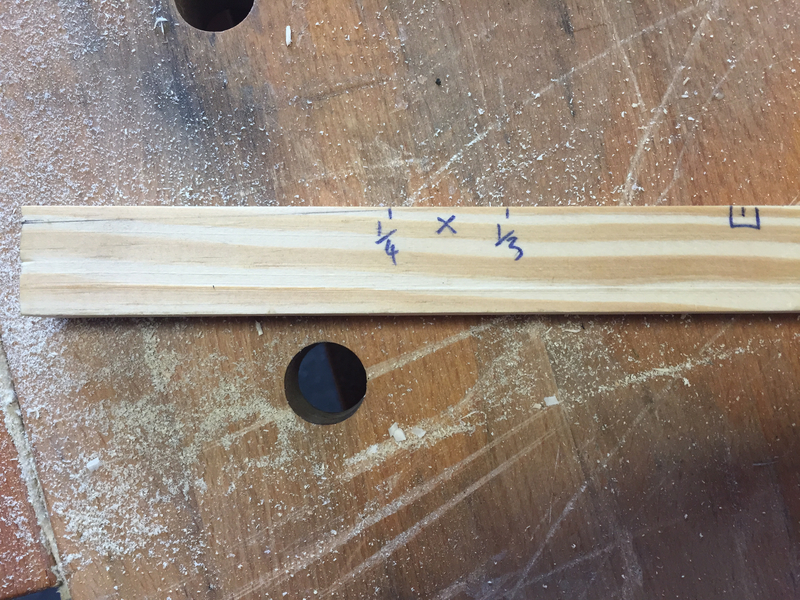 This is a very precise way of working, and with planes set for a fine cut I know that as soon as the pencil numbers have been removed from the soundboard I have reduced the thickness by 0.1mm of material. Once each number has been removed, I remeasure everything and write the new thickness of the soundboard at the same 2″ intervals. Once I am close to the nominal thickness, the numbers stop being as important, because I am testing the wood by flexing it and listening to the sound it makes when tapped with my thumb. The need to constantly remeasure means that thicknessing a soundboard will take a couple of hours, but the end result is worth it. For a yellow cedar soundboard I work to a nominal thickness of 2.7mm, and this soundboard ended up just a hair under that as the timber had good stiffness and tap tone, which allowed me to remove just a tiny bit more material. With the soundboard thicknessed, I was then able to cut the rebate in the neck which accept the soundboard when the guitar is assembled. 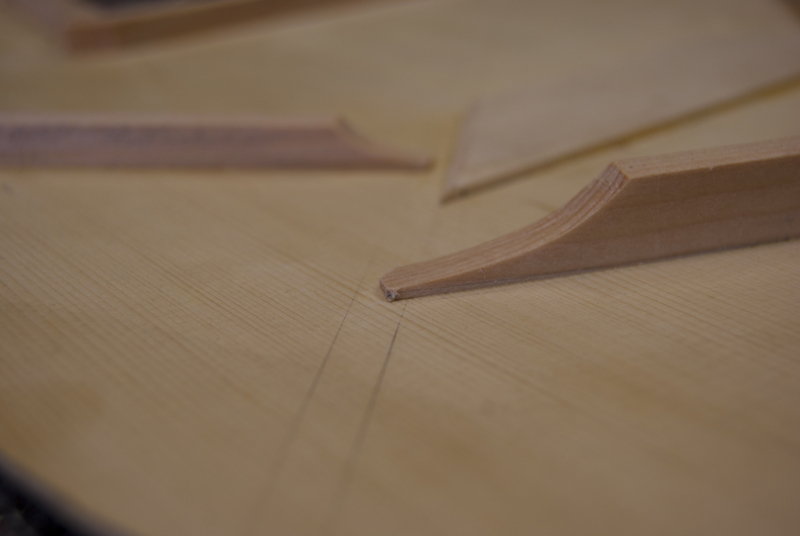 This joint needs to be cut precisely, as the top surface of the neck and soundboard need to be completely coplanar. 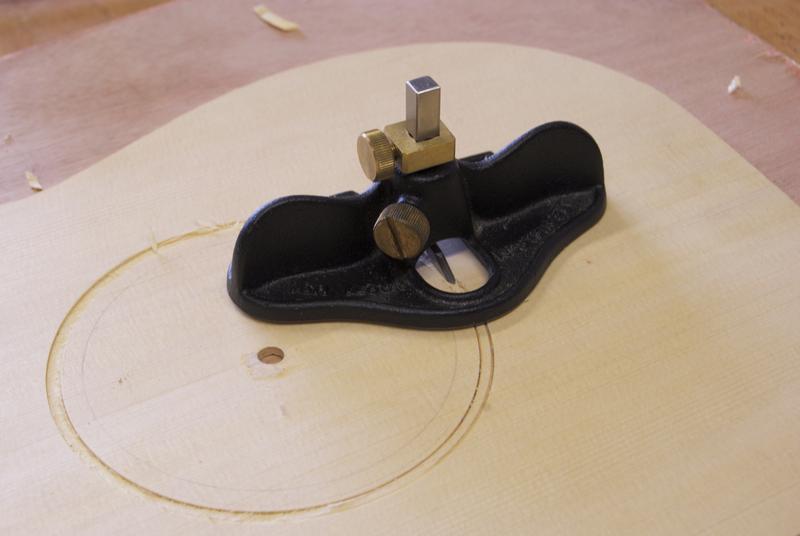 To achieve this, I set my marking gauge a hair less than the full depth of the rebate (2.5mm instead of the 2.65mm thickness of the soundboard) and once I reached my baseline I checked the fit using the soundboard, slowly sneaking up on the final fit with a very fine cut. To cut the rebate I bevelled the two outside edges with a chisel to prevent spelching, and then used a Lie-Nielsen to remove the waste.